Kampa Keg in 3.5 Litre or 7.5 Litre capacity. 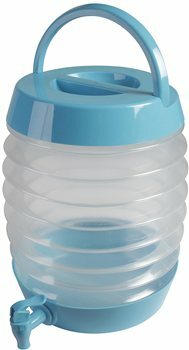 Collapsible Water Dispenser is ideal when space is limited. Great for camping, travelling with pets etc. Perfect for drinking water and folds down in a concertina fashion for storage when not in use. Complete with moulded carry handle including tap. This item arrived collapsed into quite a small size. As it is filled with water it expands to meet the demands. Filling is not easy because there is no way to hold the container except by the top of the neck. As water is drawn out the container collapses ring by ring. 7.5L - a well made product which does not leak water from the tap and remains stable with different water levels. The main downside is filling it up as the blue top has to come off, leaving nothing substantial to hold on to - hence only 4*. Also care has to be taken when screwing the top back on as it can appear to be ok when its not. I would buy again. Saw one of these outside someone else's tent last Summer and its so much better than the water carrier we had. We've bought this one this year and its so much more convenient and easy to use. Easy to fill, carry and a superb tap as well. It folds up very small for transportation as well - recommend.